Round-Up Saloon in Dallas, Texas. The Round-Up Saloon has been a satisfied client of Overdrive Productions for several years. The relationship began with some minor repairs to fix a tired sound system which was subsequently replaced by a more modern, high-end system. The most recent project is a state-of-the art video system utilizing the Knox RS16x16HB matrix switcher as the central audio-video processing hub. Overdrive chose Knox because of their reputation for providing a robust design, simple operation and a high level of performance. The Round-Up Saloon, an upscale C&W Club has a lot of history and used to be the Old Warsaw Restaurant. With a great decor, clean and friendly atmosphere and an exciting a/v system, the Round-Up Saloon hosts numerous charitable events including an annual Christmas stocking auction. Proceeds go directly to the Legacy Founders Cottage, a foundation operating a Hospice House specializing in the care of the terminally ill and those afflicted with AIDS. Overdrive Productions Inc., a company who believes in giving back to the community will be making a donation to the Round-Up Saloon for this great charity event. Overdrive Productions, founded by Steve Vinson in 1989, is dedicated to delivering the best audio/video solutions and installations at the best prices. Steve, a talented guitarist and singer, had a love for the technical side of music which included designing his first public address system at age seventeen. Over the past fourteen years, Steve has dedicated his life to helping churches/houses of worship,schools and other venues create great audio/visual systems. 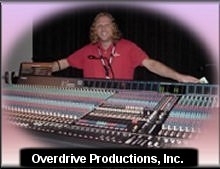 Overdrive Productions now consists of a highly qualified and friendly staff of professional audio/video engineers. Overdrive Productions, Inc. located near Dallas, Texas in Plano, not only delivers the finest professional audio video equipment, our experienced audio engineers perform superior audio and video installations. Copyright © Overdrive Productions, Inc.
Design, Marketing and Maintenance of this website by Overdrive Productions, Inc.